Finally...a new "Wish List"! 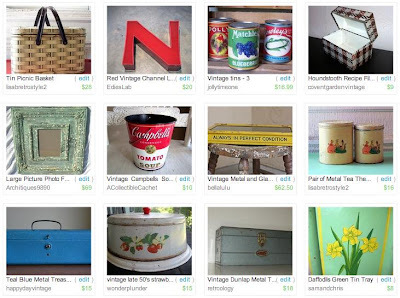 I always find that i am drawn to vintage tin / metal boxes, trays, signs, etc. Maybe it is the faded paint and rust that i love so much about each piece...it gives them a wonderful history. In fact in making this list i bought a metal sign and cabinet from bellalulu! I hope you enjoy! Thanks so much for including a couple of my items!